Actively researching since early Spring 2015, this page contains some but not all of my campus history research. 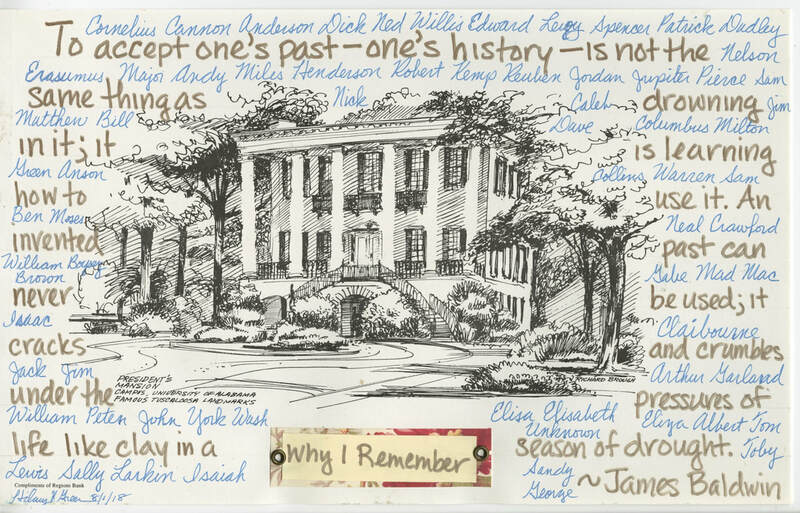 This page highlights visualizations, transcriptions, primary sources, and other materials for understanding the history of slavery at the University of Alabama and its legacy. It is designed to provide individuals who have completed one of the Hallowed Ground alternate campus tours with expanded opportunities for exploration. It is for current students, alumni and staff who want to deepen their understanding on this underappreciated campus history as well as educators who want to enrich their courses. More importantly, it is a resource for descendants grappling with this complicated history and all other interested life-long learners. It will be updated periodically with additional resources. Note: ACUMEN, the digital collections of the University of Alabama libraries, is accessible on updated web browsers. If a blank page appears, it is recommended that you try another browser or even accessing it on your mobile device. Primary Source: Rebecca Griesbach and Will Raney, "William and Hilary," Mosaic (Winter 2019): 7-11. Created by Hilary N. Green, this tour seeks to shed light onto the lives, experiences, and legacy of the many enslaved men, women, and children who lived, worked, and even died at the University of Alabama, 1829-1865. This is a printable 11 x 17 pamphlet version of the full tour. At a leisurely pace, it takes about 90 minutes. Created by Hilary N. Green using Adobe Spark, this is device friendly version of the shortened alternative campus tour designed for classes (50 minute or 75 minute) and Black History Month. At a leisurely pace, it takes about 45-60 minutes. The Associated Press, “University of Alabama apologizes for slave past,” NBCNews.com, April 20, 2004, http://www.nbcnews.com/id/4759657/ns/us_news-life/t/university-alabama-apologizes-slave-past/#.W3GFACOZNVo. Gilbert Cruz, “UA apologizes for history of slavery,” Tuscaloosa News, April 21, 2004, http://www.tuscaloosanews.com/article/DA/20040421/News/606106583/TL/. The Associated Press, “UA student researches slavery on Tuscaloosa, campus, Al.com, October 20, 2013, https://www.al.com/news/tuscaloosa/index.ssf/2013/10/ua_student_researches_slavery.html. Almosa Pirela-Jones, “Gender and Race Studies professor researches UA’s links to slavery,” The Crimson White, February 16, 2017, http://www.cw.ua.edu/article/2017/02/professors-research-slavery. “Teaching Slavery and Its Legacy Offers Unique Possibilities,” A&S Teaching Hub, December 13, 2017, https://teachinghub.as.ua.edu/faculty-blog/teaching-slavery-and-its-legacy-offers-unique-possibilities/. Ruben Tarajano, “Our University must further its recognition of the history of slavery,” The Crimson White, February 19, 2018, http://www.cw.ua.edu/article/2018/02/op-ua-slave-history. Ed Enoch, "Panel sought for University of Alabama's racial history," Tuscaloosa News, October 16, 2018, https://www.tuscaloosanews.com/news/20181016/panel-sought-for-university-of-alabamas-racial-history. (pdf copy available here). Kennedy Plieth, "Slavery pop-up museum examines Reconstruction in Tuscaloosa," The Crimson White, December 7, 2018, https://cw.ua.edu/49311/news/slavery-pop-up-museum-examines-reconstruction-in-tuscaloosa/. Rebecca Griesbach and Will Raney, "William and Hilary," Mosaic (Winter 2019): 7-11.